Oh, hello there Monday! Can I interest you in a little post-weekend pick-me-up? Nod at your screen if that’s a yes. Ok… I’m going to assume you’re nodding now so… WABAM! 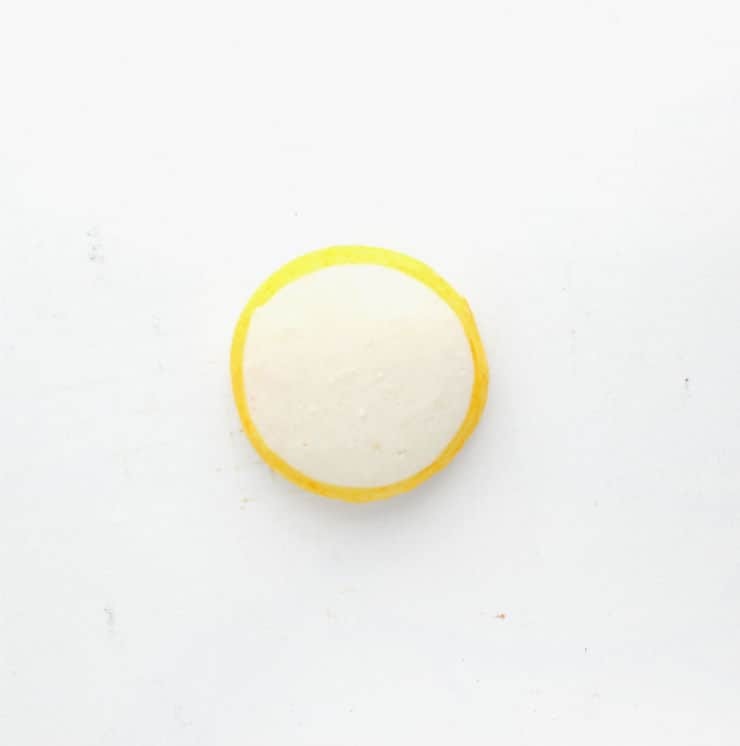 Sunny lemon macarons! Seriously, opening my refrigrator and seeing these happy little macarons is what I imagine it would feel like to have my refrigerator play Wake Me Up Before You Go-Go by Wham! every time I opened it. Side note: refrigerator manufacturers, can we make the a thing? Pleeeeeeeeeeeeeease?! Also, ever since I saw Ashley of Sugar & Cloth‘s DIY fruit macarons, I knew I had to work that into a post somehow. It obviously plays into my minor obsessions with foods that look like other foods. P.S. If you’re not following this woman on some platform, you need to PRONTO! You will be hard pressed to find tastier food photos than her’s! 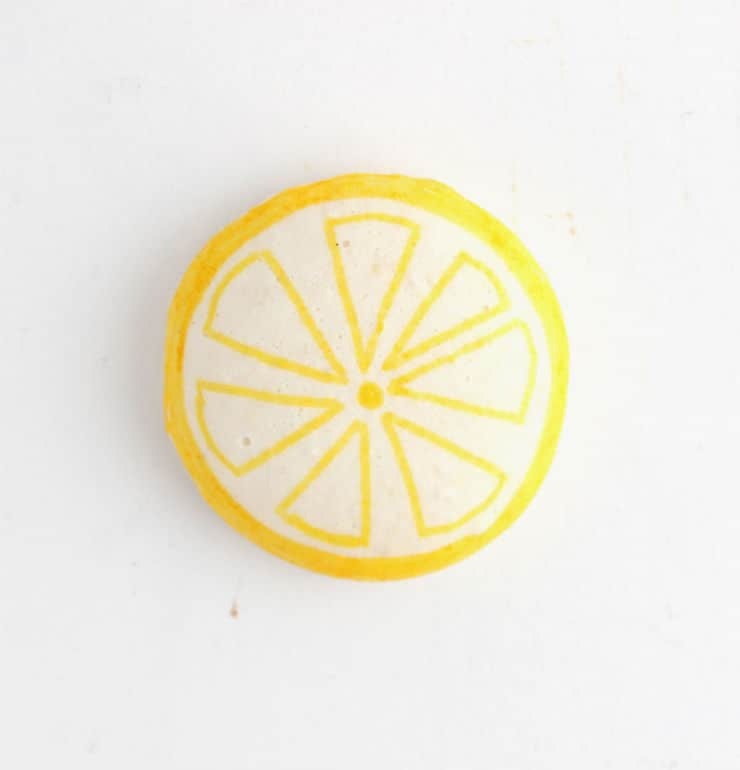 Just like Ashley, I used food pens to create my lemon design (I used FooDoodler pens). I started by coloring around the edge with a yellow pen, then filling in the center with yellow triangles for the wedges. To create some shading and contrast on my design (because I love me some shading and contrast) I outlined the lower part of the wedges with an orange food pen and blended it out with the yellow. 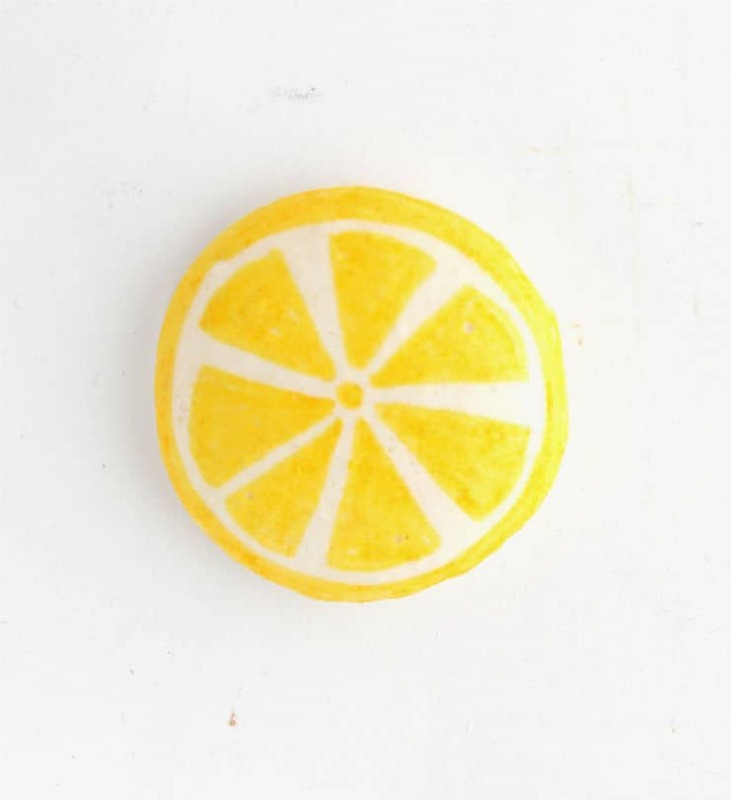 I also adding some orange dots around the edge to mimic the pitting lemons naturally have in their skin. In the bowl of a large mixer, whisk together the eggs and egg white powder (or meringue powder) until frothy. 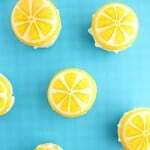 Add the granulated sugar and whisk on high until stiff peaks form, adding your lemon juice at the last minute. 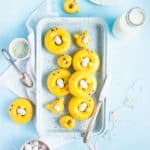 Using a food processor, pulse your almond flour, powdered sugar, and lemon zest until smooth using 2-3 second intervals. Gently fold your dry ingredients into your meringue until just combined. Spoon your macaron batter into a piping bag and pipe onto a parchment paper lined baking sheet. For the sake of uniformity, it’s a good idea to use a template to make sure they’re all about 1.5″ across (I made my own using a 1.5″ round cookie cutter to trace circles onto a piece of paper). Holding your baking sheet firmly, slam it onto the counter 2-3 times to work out the air bubbles. 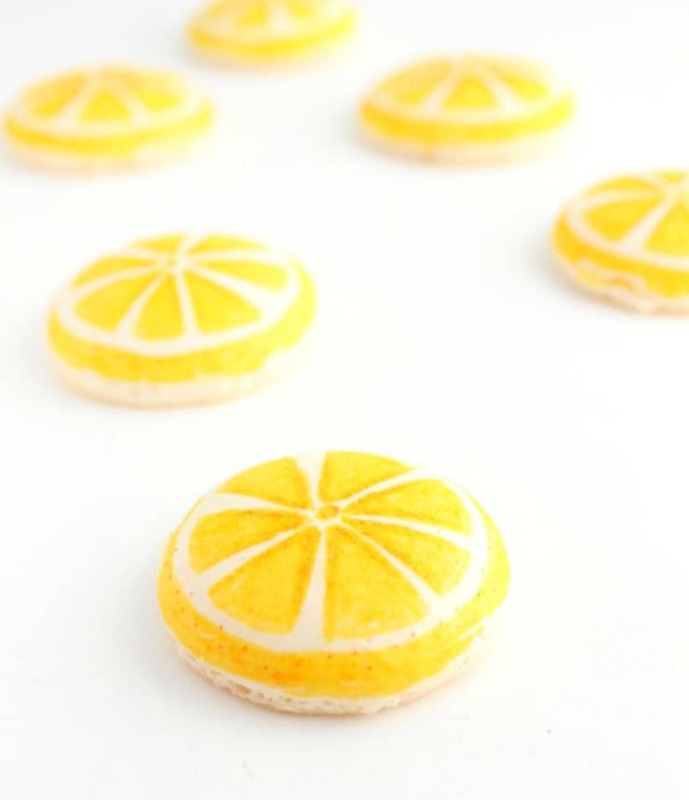 Allow the macarons to dry slightly before baking by leaving them on the counter for 30-60 minutes. Bake them at 325F/160C for 9-11 minutes, or until they easily pull away from the parchment paper. To make the cream filling, simply whip the heavy whipping cream until stiff peaks form. You can sweeten the macarons by adding some sugar or vanilla extract to your filling, but I kept mine neutral so the tartness in the shells could really shine through. 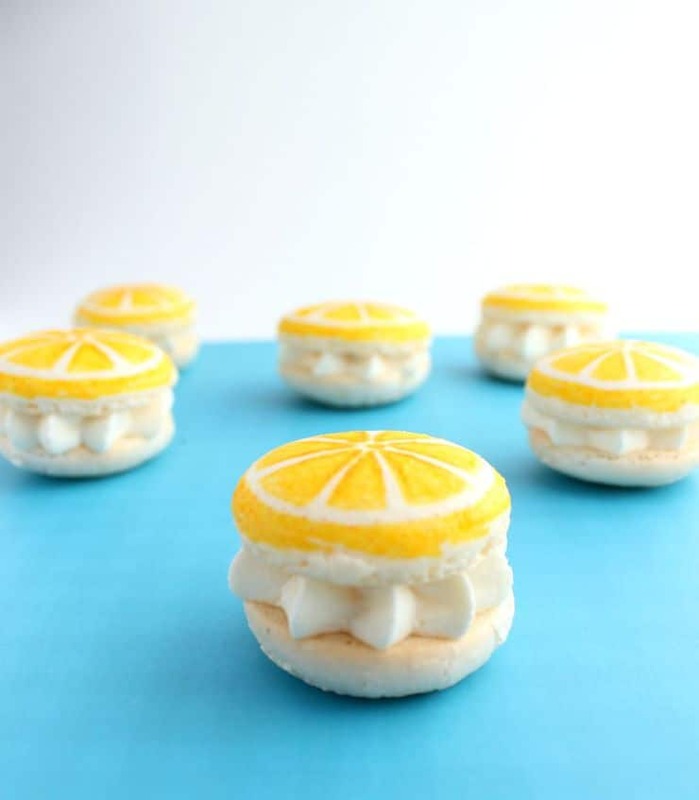 One, I love that you made LEMON macarons. 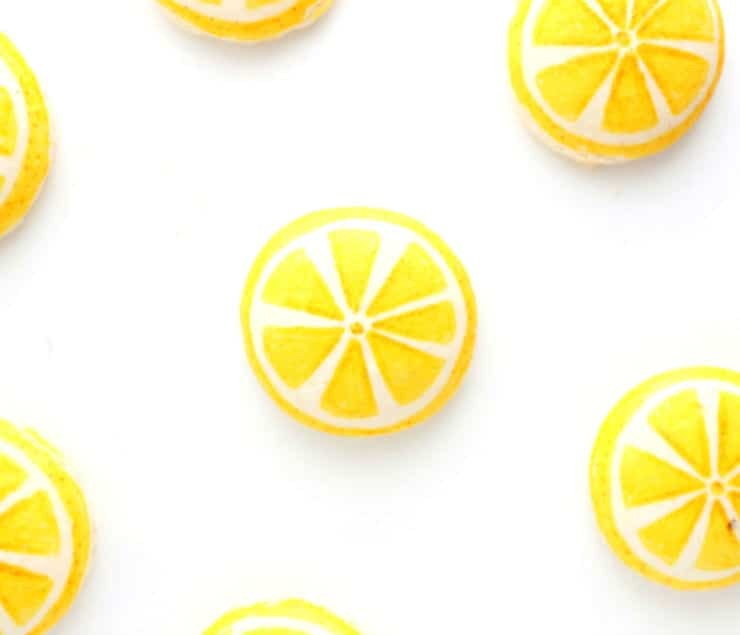 Two, they’re even better because you colored them to look like lemons. So cool! Pinning and FBing. Thank you! 🙂 I’m so glad you liked all the little details! 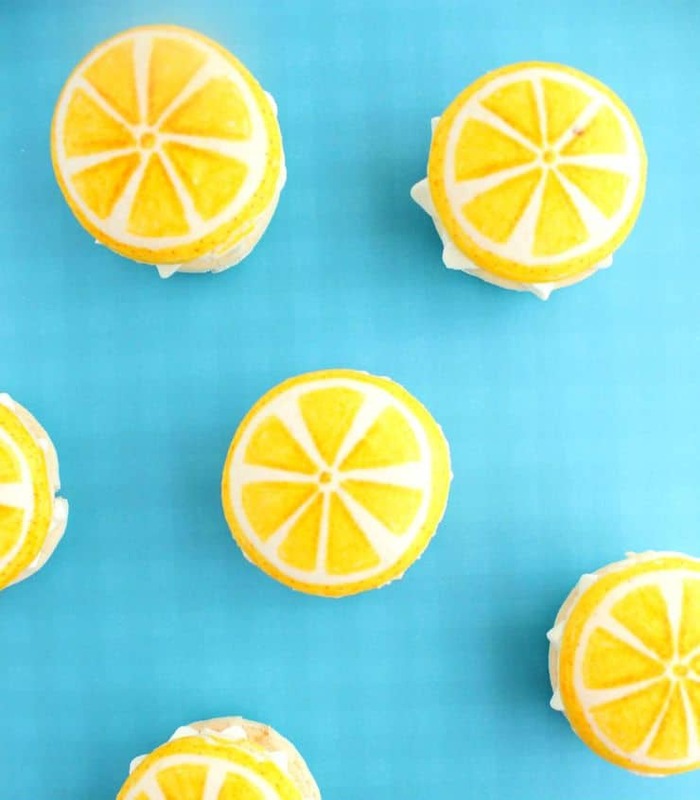 OMG I LOOOOVE the colored lemon pattern – this is so adorable <3 pinned to my dessert board! These are so freakin cute! Thanks for posting. Hello from What’s Cookin’ Wednesday. 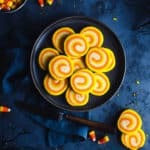 These look so beautiful! 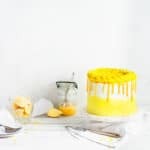 I love the bright yellow, it would really pop on a desert table (pinned!). They definitely do add a pop of color! 🙂 Thanks so much for pinning! 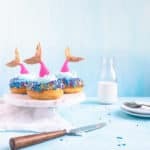 I’m thinking about making these over the weekend for my friends birthday, but I just want to know- do you have to use almond flour or would all purpose flour work too? What a sweet gesture for your friend! 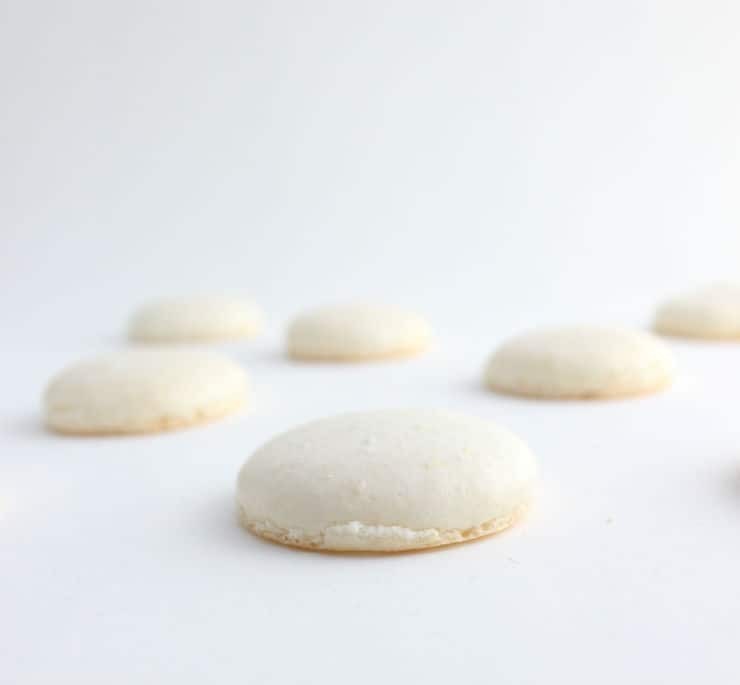 🙂 With macarons you definitely need to use almond flour (all purpose flour just won’t work the same), but if you don’t have access to it where you are, you can easily make your own by grinding up plain ol’ raw almonds.